Several months ago I asked my Olivia what she wanted the theme for her fifth birthday party to be. 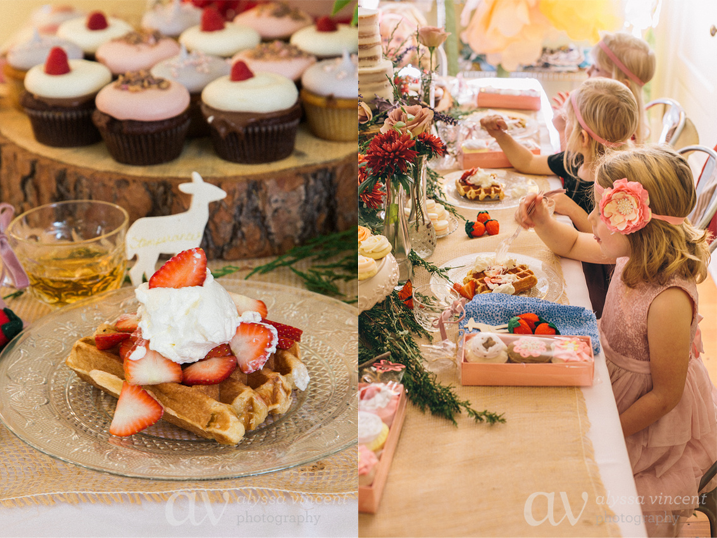 She immediately responded by telling me that she wanted a fairy princess party--so we set out to create an event that would be extra magical and, as Liv and I sat around the kitchen table giggling and dreaming up ideas that afternoon, Olivia's Fairy Fest party began. My first thought was that Olivia would need a pretty crown with large flowers. I knew that Think Pink Bows could make us something truly special and turned to Emily to collaborate on the project. (You can buy this special edition "Fairy Flower Crown" on thinkpinkbows.com HERE.) 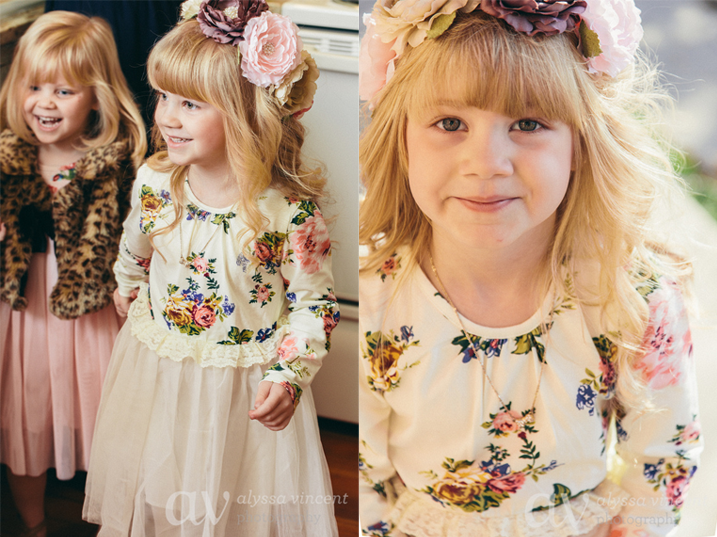 Her team was able to come up with the most stunning headbands for each of our guests in addition to the flower crown. (You can find the "Fairy First Attendant" headband HERE.) Olivia, Emery and I were speechless when we met at her studio for fittings and saw the finished product. The workmanship, quality and attention to detail is the best of the best. I wanted to design an invitation that was very simple, adorned with several sprigs of fresh greens and wildflowers fastened by jute. 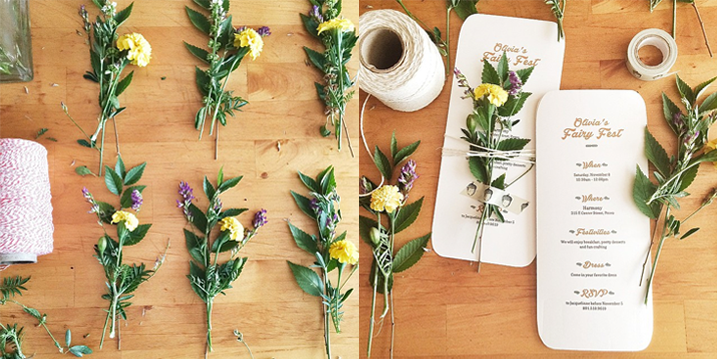 The girls and I had so much fun running through the garden, cutting and gathering the greens and flowers. Olivia lined up all of the flowers neatly in piles and beamed with joy when she saw how lovely they looked all marching in a row. Harmony of Provo generously hosted the party for us at their character-filled fine fabrics and knitting boutique. The home, known as the Hannah Maria Libby Smith House, dates back from 1878. The space is quaint, charming and was perfect for the occasion. If you are local here in Utah this is a shop that you mustn't miss. The table spread was of utmost importance for this enchanted party. I wanted the feeling to be mystical and as if you had stepped right into an enchanted forest with flowers, lots of fresh fruit, fairies and butterflies. I created the flower arrangements using wildflowers from the garden, fresh mums, roses and oranges from the grocer and butterfly picks that I picked up at Michaels. 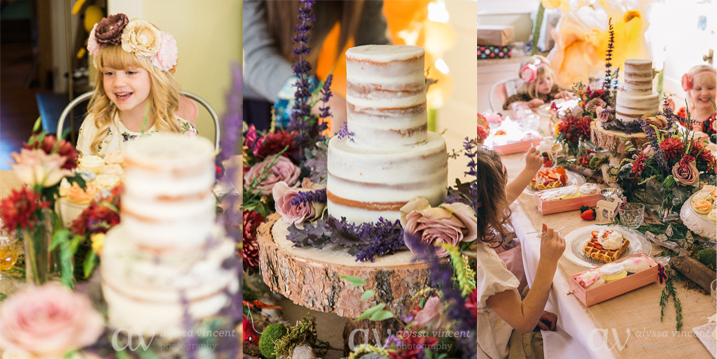 The incredible natural wooden cake stands were provided by Postscripts. 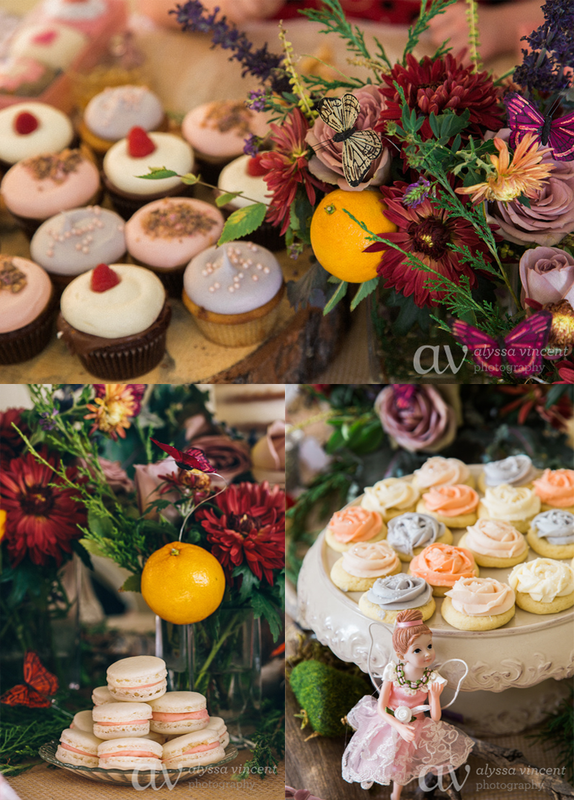 The delectable macaroons were made by Sprinkle & Dash, lovely rose frosted sugar cookies were provided by Shirley's Bakery and decadent cupcakes were provided by Cocoa Bean Cupcake Cafe. These sweet treats were not only gorgeous but were scrumptious and enjoyed by all in attendance. One of Olivia's requests was that we have waffles for the celebration. I knew that I wanted them to be equal parts pretty and delicious. The waffles provided by Waffle Love were light, buttery and flaky--almost like a pastry--and, in short, divine! The party favors were the most fun part to coordinate. Olivia wanted every girl to go home from her party equipped "With everything that they needed to be a fairy." 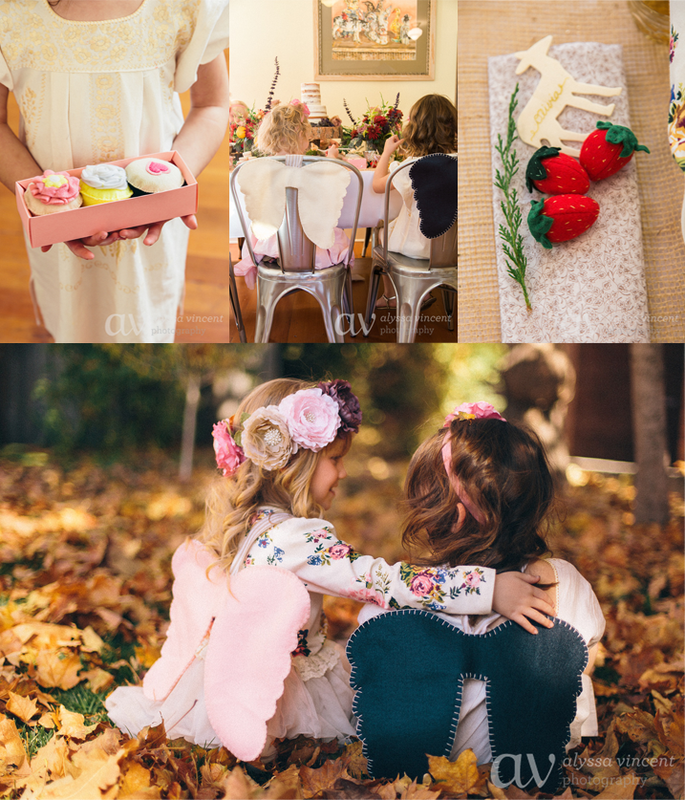 This included fairy wings that I hand stitched and can be purchased in our shop here, beautiful custom headbands and Olivia's flower crown provided by Think Pink Bows, darling felt Strawberries created by Marmies Market, and the sweetest cupcakes made by Burnt Gingerbread Creations. Some of the gifts that we gave Olivia included the most perfect handmade bunny and riding hood dollies. She adores her new snuggly friends. As Olivia snuggled into bed the night of her party she set her head onto my shoulder and whispered, "Thanks for always making me feel so special." 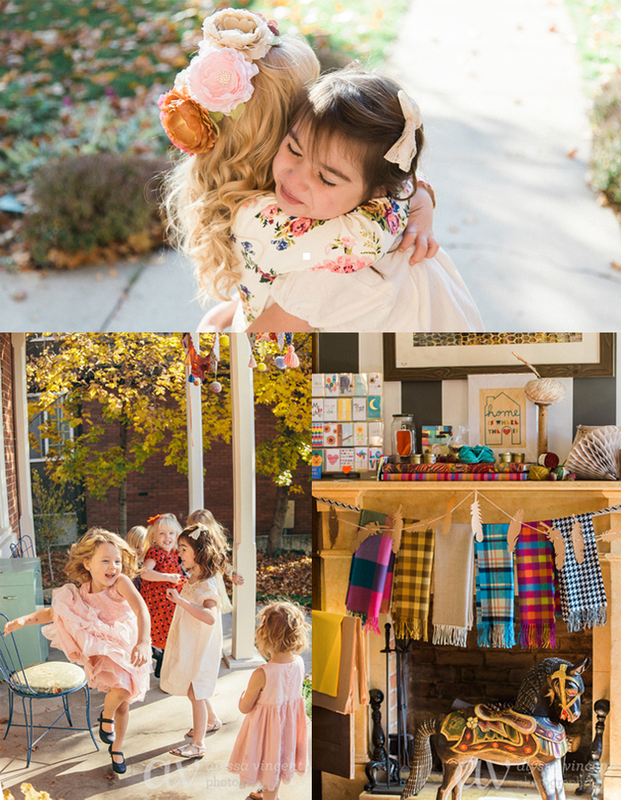 We are so grateful for wonderful friends and all of the amazing vendors and individuals who contributed their talents to make this day so special for our Livie girl. Find the "Fairy Flower Crown" headband HERE. Find the "Fairy First Attendant" headband HERE. Photography by the lovely and talented Alyssa Vincent Photo. ENTER FOR A CHANCE TO WIN THE SWAG BAG EACH OF OUR GUESTS TOOK HOME ON OUR BLOG HERE. GIVEAWAY ENDS FRIDAY, NOV. 20TH, 12:00AM MST. What an amazing fairy wonderland you all created! Everything looked amazing, especially the birthday girl. Thanks for sharing!